Scott Solomon was born and raised in Southern California. He enlisted in the U.S. Air Force on January 14, 1988, and after graduating as a Distinguished Graduate of Basic Military Training at Lackland AFB, Texas, he attended Precision Measurement Equipment Laboratory training at Lowry AFB, Colorado, from February to October 1988. His first assignment was with the 1550th and then the 377th Component Repair Squadrons at Kirtland AFB, New Mexico, from October 1988 to July 1993, followed by Officer Training School at Maxwell AFB, Alabama, beginning in July 1993. He was commissioned a 2d Lt in the U.S. Air Force on November 19, 1993, and then attended Electrical Engineering training at Keesler AFB, Mississippi, from November 1993 to April 1994. 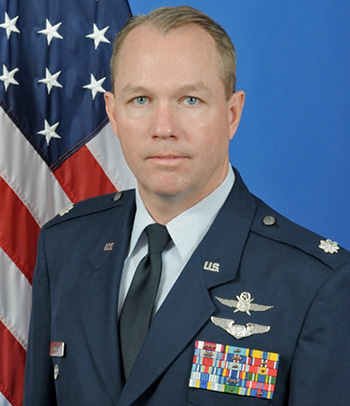 His next assignment was as a Systems Engineer and Data Network Manager for the 30th Range Squadron at Vandenberg AFB, California, from April 1994 to June 1997, followed by service on the staff of Headquarters Air Combat Command at Langley AFB, Virginia, as Chief of C4 Operations Research and then as Chief of Mission Systems Engineering, from June 1997 to June 2000. Capt Solomon served as Commander of the Airborne Communications Flight and then as Chief of Airborne Communications Operations flying aboard the E-4B National Airborne Operations Center aircraft with the 1st Airborne Command and Control Squadron (ACCS) at Offutt AFB, Nebraska, from June 2000 to June 2003. He then served as Commander of the Information Systems Flight with the 51st Communications Squadron at Osan AB, South Korea, from June 2003 to July 2004, followed by service at Headquarters U.S. Air Force in the Pentagon from July 2004 to September 2006. His next assignment was as Chief of C2 Communications in the Combat Plans Division of the Combined Air and Space Operations Center at Al Udeid AB, Qatar, from September 2006 to January 2007, followed by service with Headquarters U.S. Air Force at the Pentagon from January 2007 to June 2008. LtCol Solomon served as Commander of the 333rd Training Squadron at Keesler AFB from June 2008 to July 2010, and then as Deputy Commander of the 81st Training Group at Keesler from July 2010 to April 2012. His next assignment was as Executive Officer to the Commander of Air Education and Training Command at Randolph AFB, Texas, from April 2012 to June 2014, followed by Air War College at Maxwell AFB, Alabama, from July 2014 to May 2015. Col Solomon is currently serving as Commander of the 81st Training Group at Keesler AFB. For sustained meritorious achievement while participating in aerial flight 7 September 2001 to 21 March 2002. Captain Scott E. Solomon distinguished himself by meritorious achievement while participating in sustained aerial flight as Chief, E-4B Airborne Communications Operations and Evaluator, 1st Airborne Command Control Squadron, 55th Operations Group, 55th Wing, Offutt Air Force Base, Nebraska. During this period, the airmanship and courage exhibited by Captain Solomon while performing vital Joint Chiefs of Staff-directed missions supporting the President and the Secretary of Defense demonstrated his outstanding proficiency and steadfast devotion to duty. These distinctive achievements were accomplished while engaged in high priority operations where he ensured the federal government could maintain continuity during military or natural emergencies. The professional ability and outstanding aerial accomplishments of Captain Solomon reflect great credit upon himself and the United States Air Force.